One of main favorites for winning the Major – Team Liquid is playing versus Ninjas from Sweden. Liquid started great as they’ve won 5 consecutive T rounds from which 3 by bomb explosion. NiP managed to strike back with 8 won rounds from 10 played. Best in NiP were Patrik “f0rest” Lindberg and Dennis “dennis” Edman who had help from Fredrik “REZ” Sterner. 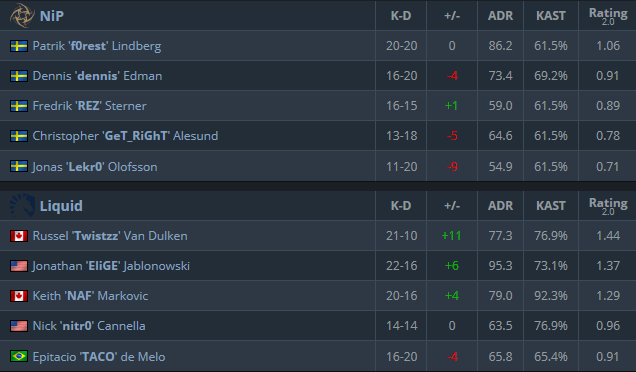 Liquid was somewhat better than NIP on defense(CT side) as they connected nine rounds with just 2 lost to NiP(T) before they’ve closed the match. Great defense by Jonathan “EliGE” Jablonowski and Russel “Twistzz” Van Dulken were just too much for Swedish side. Liquid is now 2:0 and secured their Legends status, while NiP is down to 1:1 and will have to play at least 2 more matches.